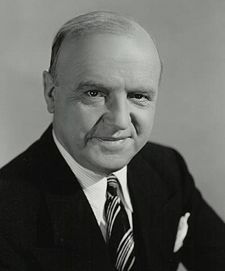 Biography: William Frawley is best known as tightwad Fred Mertz on “I Love Lucy.” Born in Burlington, Iowa in 1887 with believe it or not with a head of blonde curls. His mother loved to show them off but Bill hated them because the other kids would call him a sissy, so when he got older he cut them off. In highschool Bill had ambitions to become a journalist, but his real love was entertaining people. All of Bill’s relatives used to gather at his grandma’s house for big family sings. He had a big English tenor voice, and sang in the St. Paul’s Catholic Church choir. He also played a small role in a play at the Burlington Opera House and was also in the amature production at the Garrick Theatre. His mother, being highly religious did not want her son in show business. She urged him to take a job in Omaha, Nebraska after his highschool graduation, as a stenographer for the Union Pacific Railroad. In 1914 Bill moved out West and met and married Edna Louise Broedt and together they formed a vaudeville act called Bill & Edna. In 1927 Bill & Edna divorced. In 1933 he started landing roles in Hollywood pictures. Being in movies kept him busy till 1951, when he learned that Lucille Ball and Desi Arnaz were starting a new television show. He called Lucy and asked for the part of Fred Mertz in CBS’s “I Love Lucy”. He got the part of Fred and played it till 1960 when Lucy & Desi ended the show. Immediately after “I Love Lucy” Bill landed the role of Bub in “My Three Sons” with Fred MacMurray. In 1965, he had to leave the show because of illness. In October of 1965 Bill appeared in an episode of “The Lucy Show” called “Lucy and the Countess Have a Horseguest.” On March 3, 1966 while strolling down Hollywood Boulevard after seeing a movie, he collapsed and died of a heart attack. He was 79. This entry was posted in TV Celebrities. Bookmark the permalink. Pin my tail and call me a dknoey, that really helped. i already know this stuff!!!!!!!!!!!!!!!!!!!!!!!!! !